CSGO’s Danger Zone features a brand new map, Blacksite, which dwarfs regular CSGO maps in size, but remains absolutely tiny compared to the maps of other battle royales such as Fortnite and PUBG. But despite its modest scale for its genre, Blacksite is absolutely packed with buildings, loot, trees, cliffs, and other details that are well worth learning the ins and outs of if you want to survive there. After spending an unhealthy number of hours in Blacksite, I’ve put together the below Danger Zone map guide on the best locations for loot and for safety across Blacksite’s island. But before we get started, if you looking for a more general overview of CSGO’s new Danger Zone mode then you may want to take a look at our main Danger Zone guide, where you can find everything you need to know before exploring Valve’s fast-paced new battle royale. Now without further preamble, let’s get stuck into the very best places I’ve found to land on the lovely death-filled island of Blacksite. Before deploying into Danger Zone’s Blacksite map, you and your 15-16 opponents must pick one of over a hundred possible landing spots across the island. This is a bit of a race to lock in certain areas before your opponents, because once you choose a drop point no one else can land anywhere inside the same hex. However, it’s worth noting that if you’re playing with friends, you can all drop in the same hex, provided there are enough drop points inside that hex to accommodate each of you. While much smaller than most battle royale locales, Blacksite is still packed and detailed enough that it will take many games before you become comfortable with each of its locations. The contents of loot crates is randomised, which means there is nowhere on the map that will provide reliably better loot than anywhere else. 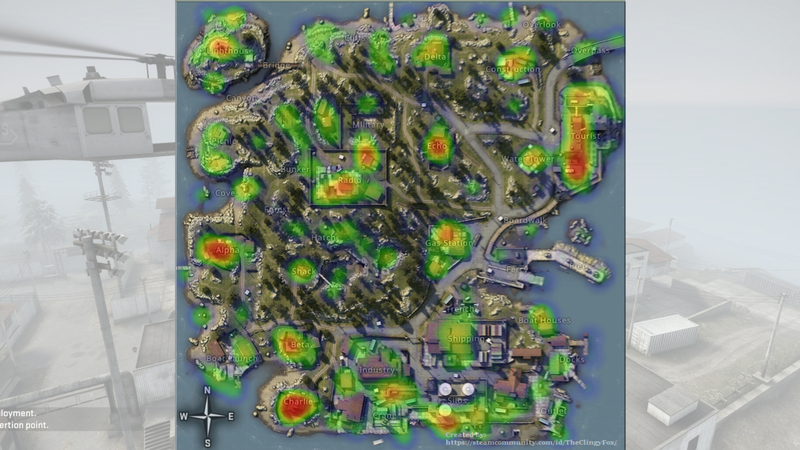 However, you can take a look below at this heatmap of weapon drop locations in Danger Zone, created by Reddit user “Davydov611” using some sort of bizarre technomancy. Just remember, red locations don’t provide better loot than green locations, but they do potentially provide a greater quantity of loot. So it’s still possible to go to Charlie or Tourist or Echo and find nothing if you’re very unlucky. That said, let’s go into some more detail about some of the best places I’ve found to land on Blacksite. Cliffs are where I first landed while learning the game (the coast is always safer than the centre of the map when deploying), and it remains one of my favourite locations for deployment. I nearly always deploy right on the edge of Bridge, and head all the way east along Cliffs until I hit Overlook. While the heatmap for Cliffs is underwhelming, in reality it’s just spread out. If all that loot were in a single location it would be a vivid red. Plus, there are multiple opportunities throughout Cliffs to head south, my favourite being the underground area which leads straight into Delta. Alpha is a lovely location for loot – possibly the best on the entire map. For this reason, you’ll have to click it quick to lock it down before anyone else. The two main buildings are often rife with crates and gear, and the nearby coast means you only have to watch three directions for nearby threats. From here, you can head inland for a raid towards Radio, or, if you feel you aren’t yet geared up enough for the centre of the map, you can rotate either north towards Picnic and Lighthouse or south to Boat Launch and Beta. Radio is probably the most reliably dangerous area on Blacksite for deployment, the reason being it’s too large for a single hex, so you can’t adequately block other players from contesting you. But if you can hold your own and win the early-game, you’ll find that Radio and the area just below Military often hold a great deal of loot; and the benefit of starting in the centre of the map is that you can rotate in pretty much any direction you like heading into the mid-game. Tourist makes this list despite my own personal feelings towards it, simply because it holds more loot than anywhere else on the map. This strength is also its greatest weakness, because it’s so large and spread out that you will almost certainly not be alone, and even if you are, it takes such a long time to loot everything that there’s a case to be made for starting elsewhere, where the loot is more compacted. Nevertheless, the player who manages to spend half the game uninterrupted in Tourist will very rarely find themselves wanting for anything. Beta is my south-west location of choice, which may surprise those of you staring aghast at the blood-red of Charlie on the heatmap. I don’t like dropping at Charlie, because after the initial few seconds of gearing up I often realise that I’m surrounded by other players who dropped Beta or Industry or Crane. Landing in Beta, however, often gives you enough gear and cash to survive the early-game, while also affording you more options when it comes to rotating or escaping danger. It’s also far enough from the centre to avoid contestation from all sides, while also near enough that you can escape inland long before the danger zone arrives. Docks provides a suitable compromise between loot and coastal safety. Gear is not always guaranteed, but the entire southern third of Blacksite is so closely bunched together that you can very easily sneak over to another area without spending much time out in the open. There’s plenty of cover all around, and you can freely rotate either north towards Boat Houses, south to Outlet, or west into Shipping and Silos. If pressured, you can also escape out back onto the pier, where players often won’t expect to find you. I’ve found that Construction, Echo, Gas Station, and Silos all provide a decent amount of loot too, but they’re less reliable in their starts as you will find often yourself contested early on in any of these locations – particularly Echo and Silos. But as long as you adhere to Ollie Toms’s Golden Rule for Danger Zone Deployment – “Never stay in one place for more than 60 seconds” – then you should be able to grab some loot and moolah and leave before you find yourself pressured by loot-hungry enemies. These are just some of the many locations available to land, of course. And you can succeed wherever you start if you’re skilled (or lucky) enough, so I do encourage you to try out all of the different drop locations over time and find out which work best for you. As time goes on and we all learn how Danger Zone works a bit better, this guide will likely be revisited and updated with the best areas for loot and protection. So stay tuned; and in the meantime, happy killing! Tagged with feature, guides, Valve, Counter-Strike: Global Offensive.